My name is Sherri Fulmer Moorer. I write because I’ve always loved to do it, and ebooks gave me an opportunity to share those stories with readers that I just couldn’t pass up. Plain and simple, I’m an opportunist. When the ebook revolution hit, I dove in because I wanted to be involved on the front end of this new wave. Who doesn’t want to be part of a revolution? I write in a variety of genres because I can’t be pigeon holed into one area, and I’m many other things in addition to being an author. I work full time in professional licensing, which is great for keeping me in touch with people and reality and, in turn, inspires me to write more. I’m married and live in the woods with two parrots that keep our hearts, home, and lives filled with joy and silliness that most people find strange. I’m a book reviewer, social media rambler, and borderline introvert/extrovert whose kindred spirit, according to online quizzes, is somewhere between a Sith Inquisitor from Star Wars and Scooter from The Muppets. 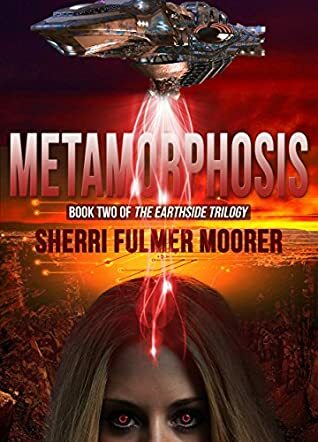 Book Two of the Earthside Trilogy, Metamorphosis by Sherri Fulmer Moorer is a compelling sci-fi with memorable characters and a conflict involving aliens and technology at its peak. Hailey is a distressed woman — abandoned by her husband because of her Parkinson’s disease after losing her father to death. Now, she lives for one thing: nano-science. When a power surge through Earth’s satellite system destroys the nano-technology, Hailey knows she has nothing left to live for. But it’s just the beginning of chaos because threatening voices invite her to help them gain control of Earth’s technology and evolution. She is dealing with powerful aliens who might as well take control of everything on Earth, and only her knowledge and skills can stop them. Can Hailey and her brilliant colleagues in nano-technology mobilise in time to stop the invasion of Earth by aliens? It will be very surprising if Sherri Fulmer Moorer is not a scientist herself because of the complexity of the ideas that come across in her novel. I loved the protagonist immensely; a woman with a disturbing illness and a sharp mind becomes compelling enough for a complex story. The plot is multifaceted and there are many surprising turns to give readers hair-raising moments. The concept behind this story is a great one and the author seems to have done a lot of research into her subject. The writing is confident and the narrative voice comes across clearly and strongly. I enjoyed the way the author explored the internal conflict in the protagonist, an aspect of the narrative that will provoke powerful emotions in readers. Metamorphosis is a title that features unforgettable characters and a fast-paced story that will keep readers in their seats for hours.